Jesus spoke of the kingdom of heaven and then the kingdom of God. Are these the same and if not, what are the differences between the two? A kingdom is nothing without a king and our King is Jesus Christ and we are told to seek first the kingdom above all things (Matt 6:33) and this really means that we must seek the King of that kingdom first and foremost. If we want to know about the kingdom we must know about the King of that kingdom and whether it is the kingdom of heaven or the kingdom of God we are talking about. The King of both of these is Jesus Christ but are these two the same kingdom or are they different? Why does Jesus seem to mention two kingdoms? Aren’t they the same? If not, what’s the difference and which kingdom are we to seek first? The gospel writers Mark and Luke wrote more about the kingdom of God while Matthew used the kingdom of heaven and there are reasons for each of these writers using the different names for the kingdom. The kingdom of God is used more frequently than is the kingdom of heaven and in fact, the kingdom of God is mentioned 68 times and is double that of the kingdom of heaven (32) and there may be good reasons for that. For example, the very first words out of Jesus’ mouth in His earthly ministry were “The time is fulfilled, and the kingdom of God is at hand; repent and believe in the gospel” (Mark 1:15). Matthew was writing to the Jewish people as you can tell in the first chapter where he gives the Jewish lineage of Jesus Christ. This is because the Jews didn’t typically use God’s name as it was deemed too holy to even pronounce. Since the gospels of Mark, Luke, and John were not so much written to a Jewish audience, the word “God” is used more often since the Greeks (Gentiles) were not hesitant to use the name of God. In the gospels of Mark, Luke, and even John, we hear more about the kingdom of God and in speaking to Nicodemus, Jesus said “Truly, truly, I say to you, unless one is born again he cannot see the kingdom of God” (John 3:3) and that “unless one is born of water and the Spirit, he cannot enter the kingdom of God” (John 3:5) so the kingdom of God refers to those in the kingdom that must be born into it. The Greek wording for “born again” means “born from above” and just like we had nothing to do with our choosing when and where to be born of our mother, so too does God cause those of His own children to be born into this kingdom and be adopted by Him (Eph 1). That doesn’t mean that we don’t have responsibility because we must repent and believe, as Jesus said (Mark 1:15). Jesus frequently used “the kingdom of heaven” in His many parables describing what the kingdom would be like, what was involved in entering that kingdom, Who the Master of that kingdom was, and how many of those who were born of Abraham’s seed and expected to be entering that kingdom by birthright would be shut out of that kingdom. He angered the Jews one time by saying “I tell you, many will come from east and west and recline at table with Abraham, Isaac, and Jacob in the kingdom of heaven while the sons of the kingdom will be thrown into the outer darkness. In that place there will be weeping and gnashing of teeth” (Matt 8:11-12). Jesus also spoke about our need to be praying for God’s kingdom to come (Matt 6:10) and that should be our prayer too. We already know it is the same King of both where we read about the kingdom of God and the kingdom of heaven. There is no confusion there but there may be differences in the way or in the place where these kingdoms are referred to. Jesus seems to refer to the kingdom of heaven as an inauguration of a new covenantal kingdom and the kingdom of God as the invisible theocracy under the sovereignty of God which entails both the Old and the New Testament eras. I have read where some Bible scholars refer to the kingdom of heaven as a physical or political kingdom where the kingdom of God is more about a spiritual kingdom that’s coming of which Christ is to be King and more often refers to His coming reign. Both the kingdom of God and the kingdom of heaven are not separate entities or places even though they are about specific applications to each kingdom as to the when and the where of each. In the end, the authors of the gospels are more concerned with referring to different audiences but it is one and the same kingdom. God’s kingdoms are ruled by God and specifically Jesus Christ Who is the King of all kings and kingdoms and Lord of all lords and is Lord over all. If there is any difference or gap in these kingdoms, and I don’t think that there are significantly, Jesus is still the King of the kingdom and will reign forever and ever. That’s the most important part and the fact that we should all be on our faces and praying for His kingdom to come and to be seeking the King of that kingdom above everything else in life and on earth. 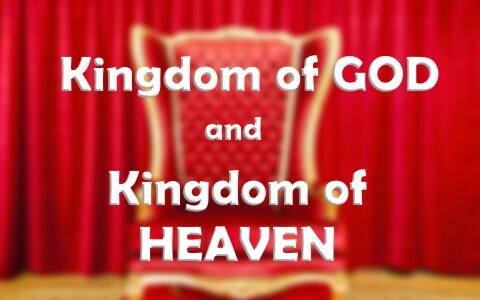 Read more about the Kingdom here: What is the Kingdom of God or Kingdom of Heaven? Thank you pastor Jack for helping us with these two phrases. I think your conclusion is excellent, and points us to what is most important. This world has many distractions, and you help us to stay focused on what is of vital importance for eternity. May the Lord bless you for all that you do! You, as always, are so kind. I had to really study hard on this one as it was harder than I imagined it would be and had to go over every combination of the words “kingdom of God” and “kingdom of heaven” and see which authors used them for it seems my brother that the authors intended audience is all important. Besides, I am nothing, He is everything so we both know that all glory goes to God and to Him alone. Thank you nonetheless my encourager. Hi Jim, I just wanted to take a moment to thank your for your words of encouragement. I agree Pastor Jack did a great job on this article. We are so blessed by the gift of exposition that he shares at WhatChristiansWantToKnow.com. I believe that both the Kingdom of God and the Kingdom of Heaven are the same as you suggest. Christians have many different ideas about what the Kingdom is though. I have not found any completely satisfying. Robert’s is an excellent approach at clearing this confusion in the link you provided at the end of your article. I like things simple and the best way for my limited reasoning in trying to figure out the Kingdom of God is simply to see it as the “Perfect Will and Purpose of God”. This fits all of those metaphors Jesus used in Mt 13, from the seed to the dragnet to the leaven and to the pearl of great price. So maybe the Kingdom of God is simply “God’s Will” and the citizens of this Kingdom are the “whosoever wills” and those outside the Kingdom are the “whosoever wont’s”. (Jn 3:16). And perhaps in the Lord’s Prayer when Jesus taught us to pray “Thy Kingdom come, Thy Will be done” He was not describing two different ideas but the same thought, restated for clarification. Just my two cents as I struggle with the idea of the Kingdom. Thank you, once again for making me think. Thanks brother. We can only view things in this side of the kingdom thru a glad darkly, right? I wait, like you do, for that great day of the King and His righteous reign and may it come swiftly my brother so I can finally meet you! Next post: Who Are The 144,000 In The Book Of Revelation?